Gaze across the St. John River from Fredericton's south side and your eyes might lock on a towering tree cresting the horizon. "What is the deal with that massive tree?" you might wonder. Gaze across the St. John River from Fredericton's south side and your eyes might lock on a towering tree cresting the horizon. "What is the deal with that massive tree?" you might wonder. "And am I the only one who's noticed it?" No. This tree stands out, not just on the skyline but also in the minds of Frederictonians. 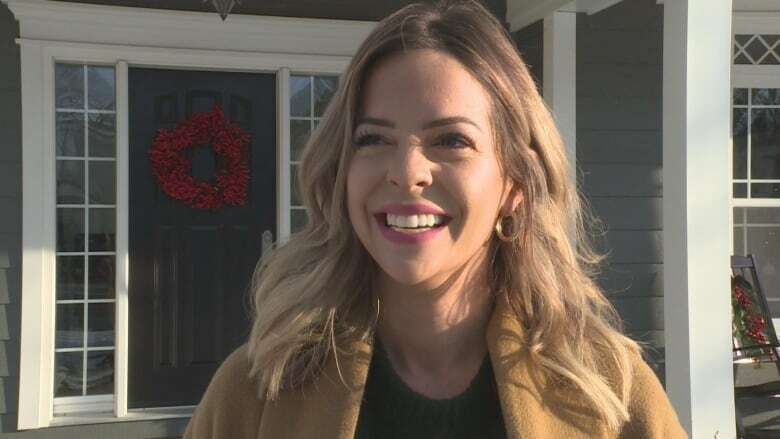 "I've always noticed, and I thought I was the only one," said Jesse Yerxa, a real estate agent. "I happened to mention it to my husband. He called me crazy, told me I was, in fact, the only one that ever noticed that tree." When Yerxa posted her thoughts about the stand-alone tree earlier this year, she soon realized she was not alone in pondering the looming timber. "It was crazy," she said. "People lit Facebook up with comments and commentary about how often they noticed that same tree. And how crazy it was that they weren't the only people that noticed it." More than 400 people reached out to her to say they, too, were curious about the tree's location and why it stood in solitude, or to confess a visit to the green giant was on their bucket list. "Everyone, I feel like, in the city, kind of came together in this weird social media post," Yerxa said. "And come to find out we all noticed that tree. "I couldn't believe how many people I was connecting with." 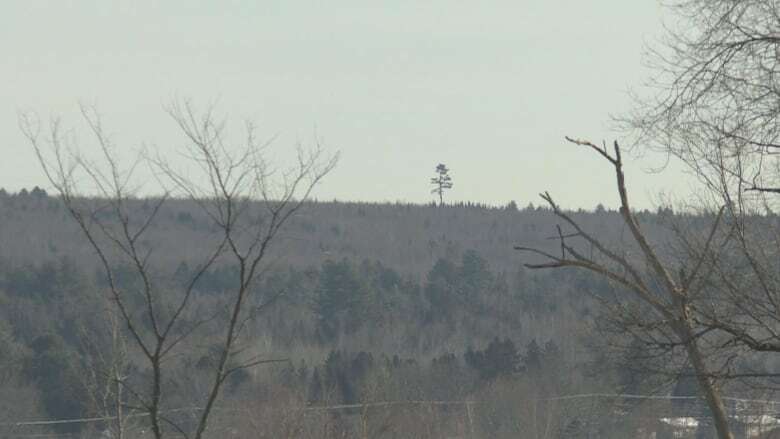 The tree is a massive white pine and can be easily seen from the Princess Margaret Bridge, sections of the University of New Brunswick campus and the Dr. Everett Chalmers hospital. It stands in an area that was clear-cut more than a decade ago, which is why it appears to dominate the landscape around it. Alders and spruce trees are growing up in the area, but all are dwarfed by this single pine, which a forester says is likely between 100 and 200 years old. And it's clear that making the trek to the tree isn't just for the wishful. There are several signs that people have made the tree a destination over the last decade. 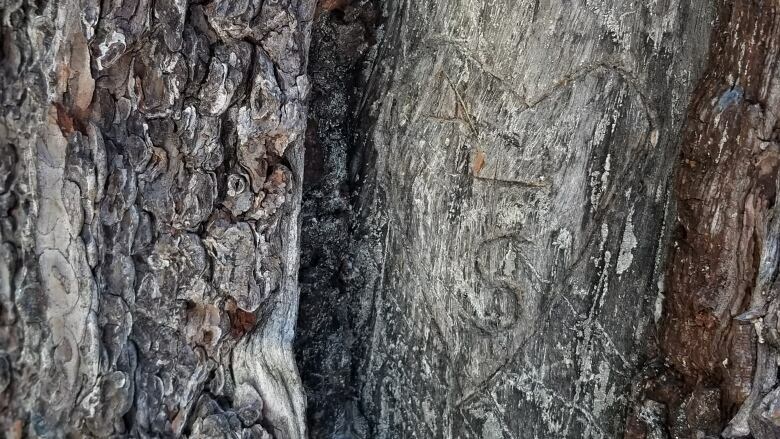 Initials are carved into the trunk. A walking stick has been left leaning on the tree as well. 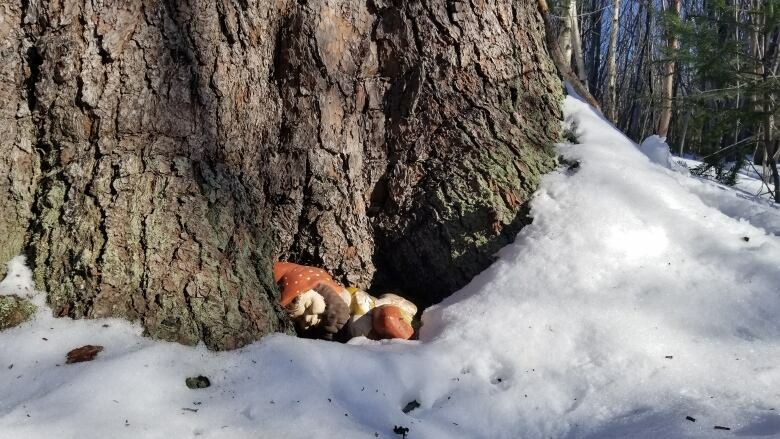 And a small, ceramic gnome sleeps on the forest floor in the tree's shadow. When the surrounding forest was cut down years ago, it's likely the giant white pine was left standing to usher in a new forest. "Often we leave those trees there to pass on seed to the next generation," said Jasen Golding, a professor of forestry and environmental management at the University of New Brunswick. "We refer to them as legacy trees or seed trees, and that's just what they are there for, is to seed in the next generation." 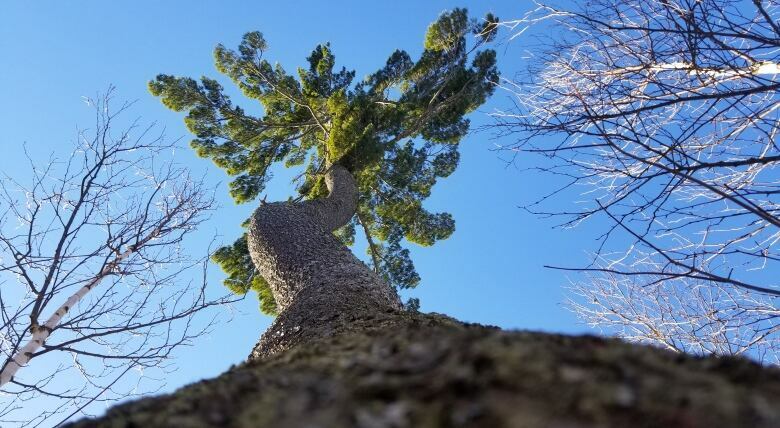 White pine are often the species left as seed trees after a clear-cut because their deep roots allow them to stand alone in winds and storms. An emergent tree is one that towers over the canopy of a grown forest. If the surrounding forest continues to mature, this white pine giant could dominate the landscape for another 300 years. "It made it this long and it made it through [tropical storm] Arthur in 2014," Golding said. "It could be a lightning strike that takes it out." Golding said the tree is probably less than 200 years old. He's based the estimate on the likelihood it sprung up after a massive forest fire in 1825 cleared away most of the woods between Fredericton and Miramichi. That fire still ranks as the seventh largest blaze in North America's recorded history, burning more than 1.2 million hectares, or almost three million acres. Golding doubts the pine made it through that fire but without a core sample he said he can't say for sure. Regardless, he said, white pines can live 400 years. "It has a long life to live yet," Golding said. 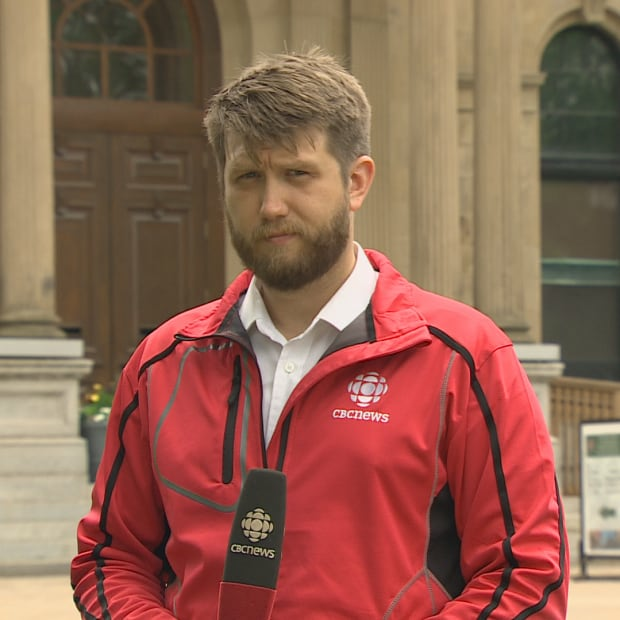 He knew exactly what tree was being discussed when CBC News called him for an interview on seed trees. "Absolutely," said Golding, who also has had a trip to the tree on his to-do list. "It's funny, I spoke with a couple of my colleagues about this, and they were well aware of it too, the minute I said it." 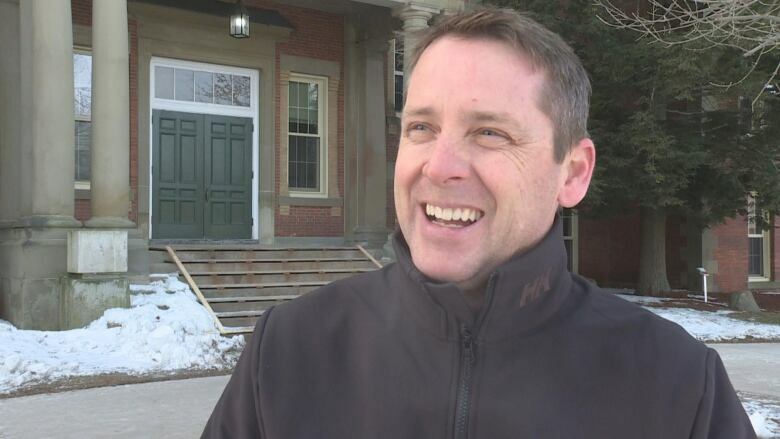 Like Golding, many in Fredericton are instantly familiar with the tree, but the man who owns the land it's growing on has been oblivious to the tree's status. "I think it's cool," said Michael Blaney, a veterinarian from Rothesay. "But I had no idea." "I grew up there and I went through all those trails when I was younger on horses and snowmobiles and all that stuff. That's where I grew up." Blaney and his three siblings inherited the land from his parents. But he has absolutely no plans to cut down. "No, no desire to cut it down," Blaney said. "I think it's amazing."